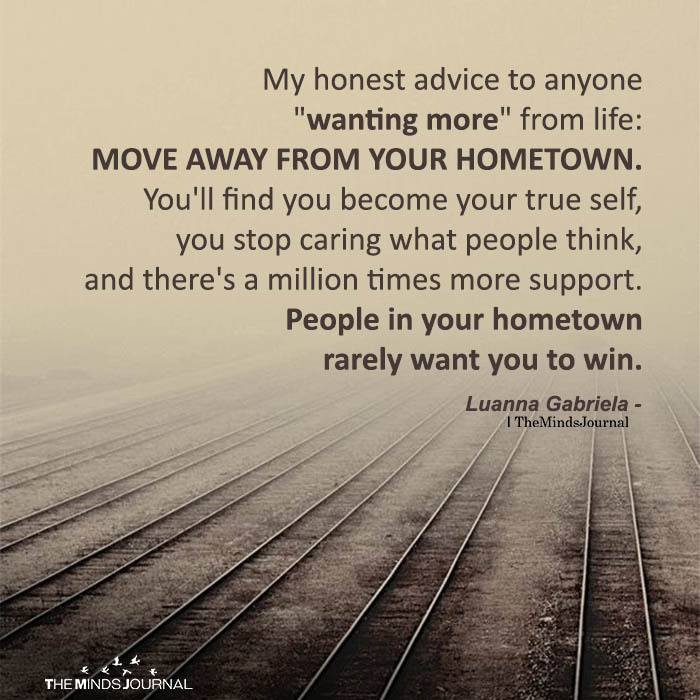 My honest advice to anyone “wanting more” from life: MOVE AWAY FROM YOUR HOMETOWN. You’ll find you become your true self, you stop caring what people think, and there’s a million times more support. People in your hometown rarely want you to win. In other words leave all your problems behind and become reinvented and healed?!! Yeah right, load of crap. Eye roll. I found my true self right in the town I’ve lived in most of my life. Guess who else lives here? My family and they love to see me “win”. I have a great group of lifetime friends too. Can’t run from your troubles. Trust me, they stay with you no matter where you go. Million times more support? From whom? Strangers.